Bean Bags have really come a long way since I was a child in terms of quality, comfort and style. Our family is enjoying our Jaxx Pillow Sac Lounger Bean Bag from The Soothing Company. This stylish bean bag lounger is a wonderful addition to our living room and is our children’s favorite spot to read, watch television or relax after a long day. When the kids are in bed, my husband and I love to snuggle together on the Jaxx Pillow Sac while watching a favorite television show in the “lounge” position. The Jaxx Pillow Sac Lounger Bean Bag is filled with 100% recycled, earth-friendly furniture grade urethane foam in a weather resistant bean bag. In addition, there is a wide selection of fabulous colors to choose from for the micro-suede bean bag cover that is easy to zip off and machine wash. As the mom of three young children, I really appreciate that the protective liner includes a childproof zipper so we don’t have to worry about them opening it and spilling any of the foam contents. Because it does not use old fashioned polystyrene beads, this durable bean bag will never require refilling either. Setting up our Jaxx Pillow Sac Lounger Bean Bag is very easy and it really has that “Wow!” factor when the foam filling immediately starts to inflate and form the shape of the bean bag. Within 24 hours our bean bag was completely ready for action and our children were more than happy to oblige and try it out. It is designed for versatile use so that it can be used as a floor pillow, a bed, a lounger or a bean bag chair. Our favorite way to use it is in the evening for our read-aloud story time since it is large enough for my three little ones and me to lounge comfortably and enjoy reading a few favorite stories together. 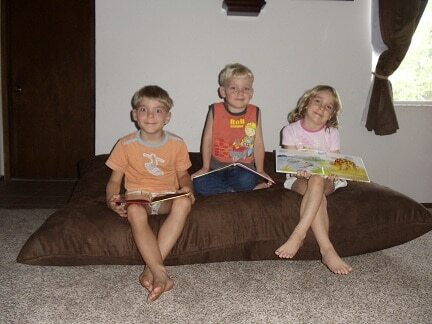 Are you wondering how could four people possibly sit on one bean bag? 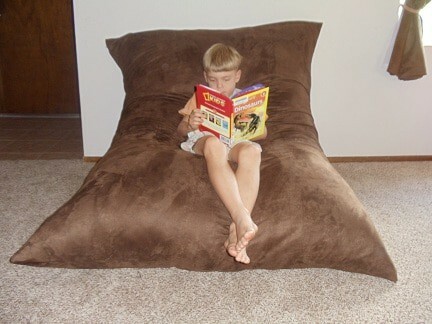 The Jaxx Pillow Sac Lounger is a whopping 5ft x 6ft and it weighs 35 lbs. The Soothing Company is proud that Jaxx Pillow Sacs have been featured on HGTV. I am impressed that a bean bag can be so versatile, stylish and comfortable. It is a fun and affordable way to update a family room, living room or child’s play room and because it is so durable it is sure to get lots of usage over the years. There are a variety of Jaxx Pillow Sacs products to choose from and price points for many budgets. Plus, you will also receive free shipping and there is no sales tax on your purchase! Are you ready for the ultimate in comfort? You are invited to visit The Soothing Company to purchase your favorite Jaxx Pillow Sac. I highly recommend the Jaxx Pillow Sac Lounger Bean Bag because it has been a big hit with my family. In addition to bean bag chairs, The Soothing Company also offers other products like water fountains, electric fireplaces, bonsai trees. I like the Omega Serenity Zero Gravity Massage Chair. I love the Mini Moonshadow Tabletop Water Fountain. I live in an apartment, so something that size is just perfect for my living room! I like the Double Glider Swinging Bench. I love the Kingsbury Media Cherry Fireplace…would look amazing in my family room. 🙂 Thank you. I like the Ashboro Outdoor Water fountain. would love to win it. Looks nice!! I would love to try the Round Copper Halogen Floor Patio Heater. Sunrise Springs Slate Wall Fountain!!!! I like the firepits! we do a lot of fires out here! the Teton Falls Wall Fountain is awesome. i want it! I love the Medium Porthole Wall Aquarium. So cool! I like the Palmetto Quilted Hammock Blue Stripe. Oh my gosh! I would love to have the Team Grill Patio Series ALL-STAR – NBA League (with the Dallas Mavericks, of course). I love the Jaxx Sac 7′ Bean Bag Chair. I saw something like at Sam’s Club. It was sooooo comfy. I also love the Omega Montage Premier Massage Chair it looks like it would be so awesome. I also like the Omega Montage Elite Massage Chair! The Teton Falls Wall Fountain is VERY cool! the Omega Montage Elite Massage Chair looks amazing! I like the Bristol Fire Column. Very cool! I would love to try the Omega Montage Premier Massage Chair. Thanks for the giveaway…we like the Hatteras Hammocks Large Quick-Dry Comfort Hammock. The Napoleon Prestige II Series PT450RB Gourmet Grill looks very nice! I love Bonsai and I would love to have the Dawn Redwood Grove, gorgeous! The Teton Falls Wall Fountain looks relaxing to the max!